System shutting down from VMware Tools request. 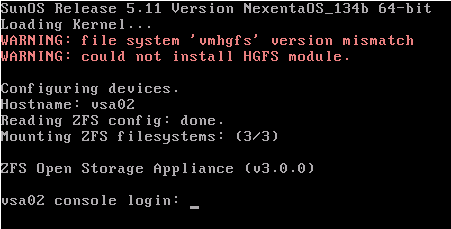 Upon reboot, there will be no complaint about the offending HGFS module. Remember that, after updating VMware Tools at a future date, the HGFS configuration file will need to be adjusted again. By the way, this process works just as well on the NexentaStor Commercial edition, however you might want to check with technical support prior to making such changes to a licensed/supported deployment. In Part 4 of this series we created two vSphere virtual machines – one running ESX and one running ESXi – from a set of master images we can use for rapid deployment in case we want to expand the number of ESX servers in our lab. We showed you how to use NexentaStor to create snapshots of NFS and iSCSI volumes and create ZFS clone images from them. We then showed you how to stage the startup of the VSA and ESX hosts to “auto-start” the lab on boot-up. In this segment, Part 5, we will create a VMware Virtual Center (vCenter) virtual machine and place the ESX and ESXi machines under management. Using this vCenter instance, we will complete the configuration of ESX and ESXi using some of the new features available in vCenter. With our VSA and ESX servers purring along in the virtual lab, the only thing stopping us from moving forward with vMotion is the absence of a working vCenter to control the process. Once we have vCenter installed, we have 60-days to evaluate and test vSphere before the trial license expires. We are going to install Microsoft Windows Server 2003 STD for the vCenter Server operating system. We chose Server 2003 STD since we have limited CPU and memory resources to commit to the management of the lab and because our vCenter has no need of 64-bit resources in this use case. Since one of our goals is to have a fully functional vMotion lab with reasonable performance, we want to create a vCenter virtual machine with at least the minimum requirements satisfied. 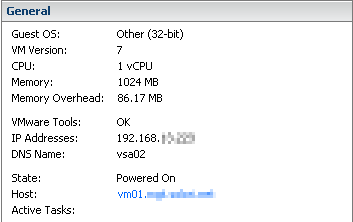 In our 24GB lab server, we have committed 20GB to ESX, ESXi and the VSA (8GB, 8GB and 4GB, respectively). 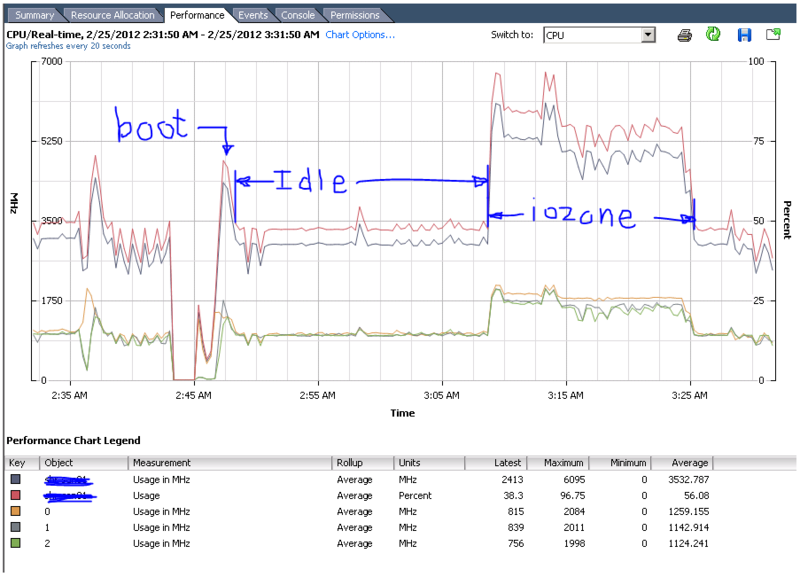 Our base ESXi instance consumes 2GB, leaving only 2GB for vCenter – or does it? 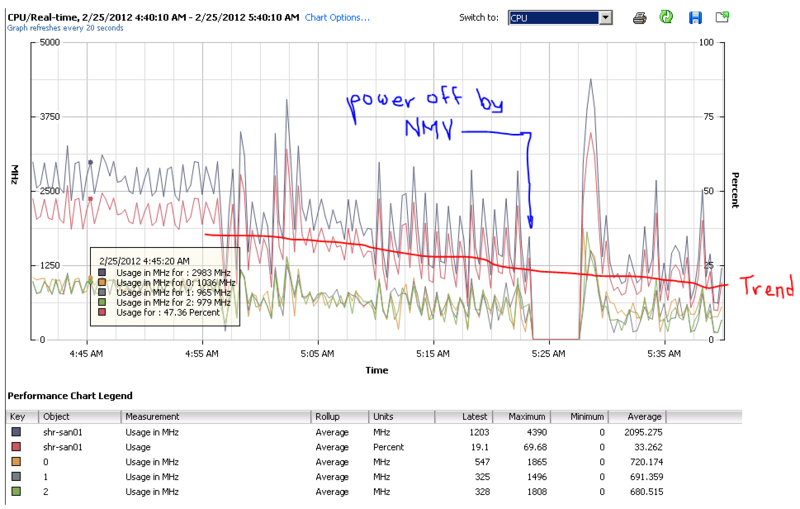 VMware ESX (and ESXi) does a good job of conserving resources by limiting commitments for memory and CPU. This is not unlike any virtual memory capable system that puts a premium on “real” memory by moving less frequently used pages to disk. With a lot of idle virtual machines, this ability alone can create significant over-subscription possibilities for VMware; this is why it could be possible to run 32GB worth of VM’s to run on a 16-24GB host. Do we really want this memory paging to take place? The answer – for the consolidation use cases – is usually “yes.” This is because consolidation is born out of the need to aggregate underutilized systems in a more resource efficient way. Put another way, administrators tend to provision systems based on worst case versus average use, leaving 70-80% of those resources idle in off-peak times. Under ESX’s control those underutilized resources can be re-tasked to another VM without impacting the performance of either one. On the other hand, our ESX and VSA virtual machines are not the typical use case. We intend to fully utilized their resources and let them determine how to share them in turn. Imagine a good number of virtual machines running on our virtualized ESX hosts: will they perform well with the added hardship of memory paging? Also, when begin to use vMotion those CPU and memory resources will appear on BOTH virtualized ESX servers at the same time. It is pretty clear that if all of our lab storage is committed to the VSA, we do not want to page its memory. Remember that any additional memory not in use by the SAN OS in our VSA is employed as ARC cache for ZFS to increase read performance. Paging memory that is assumed to be “high performance” by NexentaStor would result in poor storage throughput. The key to “recursive computing” is knowing how to anticipate resource bottlenecks and deploy around them. NexentaStor's RAM footprint with 4GB provisioned, at idle. 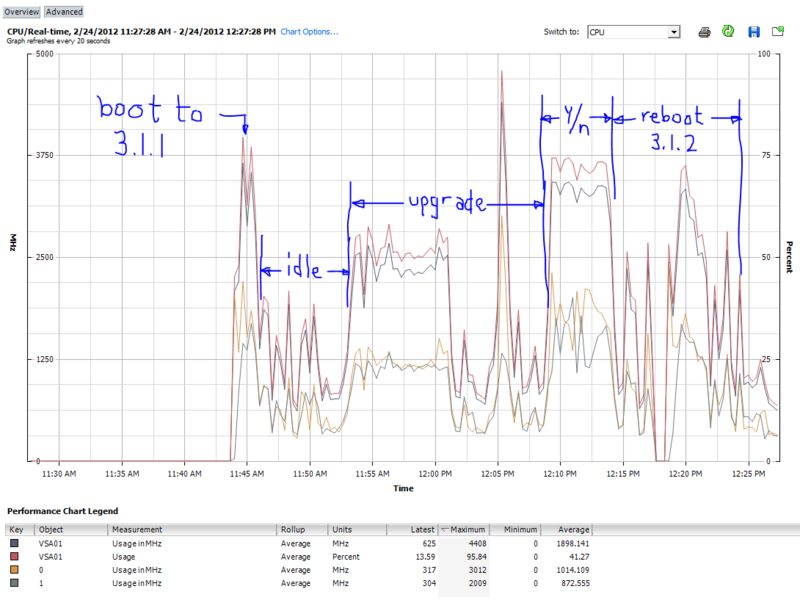 As you can see, we have specified a 4GB reservation which appears as “4233 MB” of Host Memory consumed (4096MB+137MB). Looking at the “Active” memory we see that – at idle – the NexentaStor is using about 2GB of host RAM for OS and to support the couple of file systems mounted on the host ESXi server (recursively). 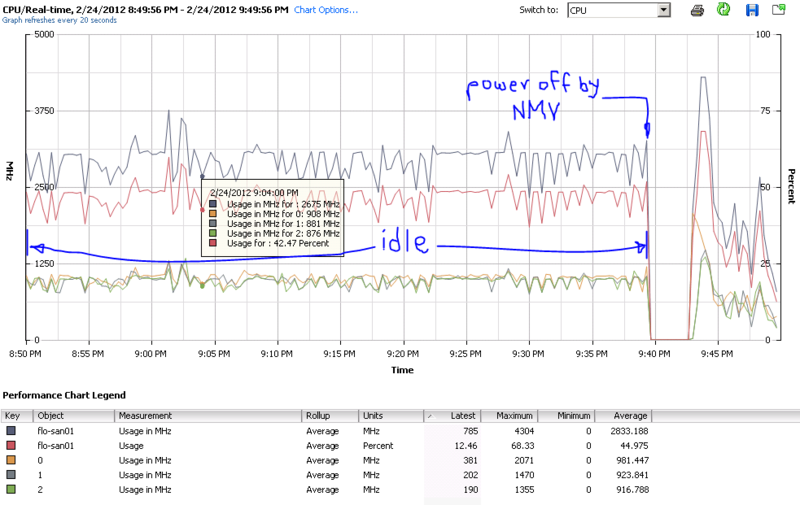 Additionally, we need to remember that each VM has a memory overhead to consider that increases with the vCPU count. For the four vCPU ESX/ESXi servers, the overhead is about 220MB each; the NexentaStor VSA consumes an additional 140MB with its two vCPU’s. Totaling-up the memory plus overhead identifies a commitment of at least 21,828MB of memory to run the VSA and both ESX guests – that leaves a little under 1.5GB for vCenter if we used a 100% reservation model. The same concerns about memory hold true for our ESX and ESXi hosts – albeit in a less obvious way. 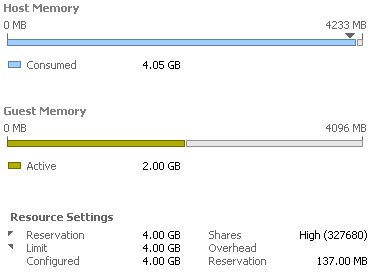 We obviously want to “reserve” memory for required by the VMM – about 2.8GB and 2GB for ESX and ESXi respectively. Additionally, we want to avoid over subscription of memory on the host ESXi instance – if at all possible – since it will already be working running our virtual ESX and ESXi machines. There are many features in vSphere worth exploring but to do so requires committing time, effort, testing, training and hardware resources. In this feature, we’ll investigate a way – using your existing VMware facilities – to reduce the time, effort and hardware needed to test and train-up on vSphere’s ESXi, ESX and vCenter components. We’ll start with a single hardware server running VMware ESXi free as the “lab mule” and install everything we need on top of that system. For the hardware items to work, you’ll need to check your system components against the VMware HCL and community supported hardware lists. For best results, always disable (in BIOS) or physically remove all unsupported or unused hardware- this includes communication ports, USB, software RAID, etc. Doing so will reduce potential hardware conflicts from unsupported devices. We’re first going to install VMware ESXi 4.0 on the “test mule” and configure the local storage for maximum use. Next, we’ll create three (3) machines two create our “virtual testing lab” – deploying ESX, ESXi and NexentaStor running directly on top of our ESXi “test mule.” All subsequent tests VMs will be running in either of the virtualized ESX platforms from shared storage provided by the NexentaStor VSA. Today we’re looking at the Xtravirt Virtual SAN Appliance (VSA) solution for use with VMware ESX Server 3. It is designed to be a simple to deploy, redundant (DRBD synchronization), high-availability iSCSI SAN between two ESX servers. We are installing it on two ESXi servers, each with local storage, running the latest patch update (3.5.0 build 143129). After conversion, you have a 2GB virtual machine (times two) ready for configuration. We removed the legacy ethernet and hard disk that came with the inventory import. Then add the “existing” disk and new Ethernet (flex) controller. We then added a 120GB virtual disk to each node using the local storage controllers: LSI 1068SAS (RAID1) for node 1 and NVidia MCP55Pro (RAID1) for node 2. 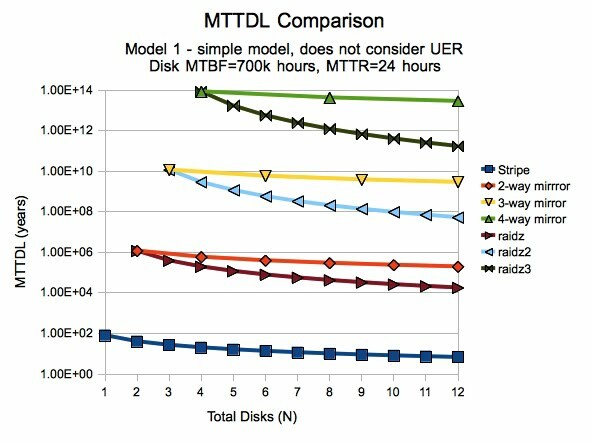 Node 1 and 2 are using the same 250GB Seagate ES.2 (RAID edition) drives. Read the rest of this entry ?